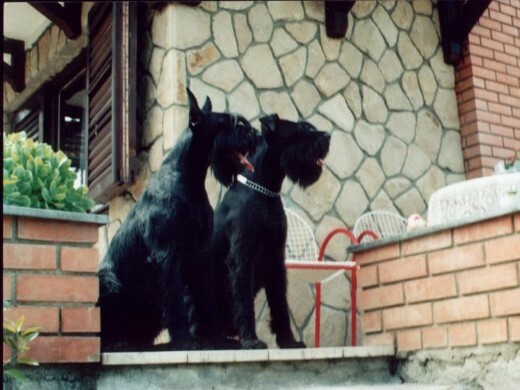 My life with Schnauzers started out with a black giant schnauzer male Ary . Year after Ary we bought black giant schnauzer female Emily. Two of them are responsible for my passion to the Schnauzers. Ary was not suitable for showing but that never stop my family and me to love him. For full 15 years he bring us joy and happiness. He left us on October 25, 2007. Emily came into my life in 1994 and opened my heart for showing and breeding. Her great and noble heart, intelligence, fearlessness, probity take my heart forever and unlock the pathway into the schnauzers world. Emily was my friend, my Lady. Her great temper and nobility put her 14 times on the top from 16 shows she attended. Emily had only one litter. Unfortunately I do not have any of Emily's progeny. Year after the litter she become very sick and more breeding would make her life shorter, so we decided not to breed her again. Every day of her life over medical prognosis made me happy. I miss my Emily so much, she left me on December 21, 2002. Few days before Emily left me my Marko bought a little dragon , that we call ''Lilly'' . Her name is Vranolujna Sienne, she is born 17.10.2002. 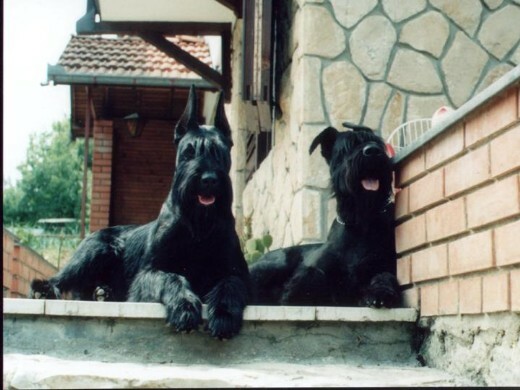 At that time I was just a young girl and very proud with my two giant dogs. I did not think a lot about miniature schnauzers, but in 1997 my brother brought home a beautiful female puppy miniature schnauzer black&silver Happy Diamond Sebastian Hogar - ''Beca''. With us is first Mimmy's female offspring, Sunflower ''Sunny'' and second female offspring Unique Flower. We are very proud with Sunflower ''Sunny' , she won Best of Breed title on the first show in Junior class ahead of her father Express Man Rezlark and she won 3rd place at World Dog Show Poznan Poland . 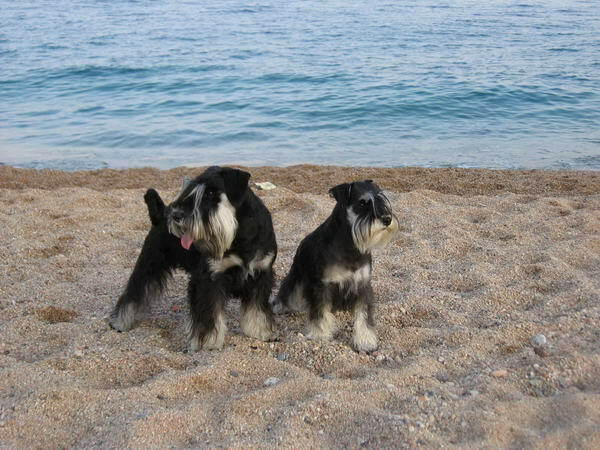 And after in co-operation with our dear friends and family our schnauzer family become larger . More about our young dogs you can find on our web pages -Silver Rainbow Calypso ''Tea'', House Kazak Fedora ''Dora'' , House Kazak Lucky Flower ''Lulu'', House Kazak Delphy ''Dara'', House Kazak Calla ''Kala'' . 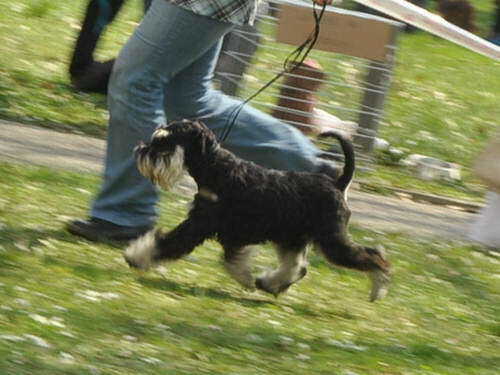 Our dogs are exhibited all over the Europe, and on all important Dog Shows in neighboring countries. We don't have much puppies per year. We are not a ''puppy factory'', and all our dogs are, most of all, our pets who live in family apartments or houses as equal family members. All our puppies are born and live in houses where they already acquire primary upbringing. Our puppies are for the people and families who think alike. Due to a bad experience with a breeder from Alpharetta, Georgia, we require a deposit for puppy reservation, particularly for the puppies who need export documentation and export pedigree. Our goal is development of the breed in Serbia . Everything we do is done for the purpose of further development of the breed. Thats why we imported stud males. They are, already proven show quality and stud dogs Express Man Rezlark, Vital Vis a Vis, Little Boy Vis a Vis and new boy in the team Chelines Lucky France . 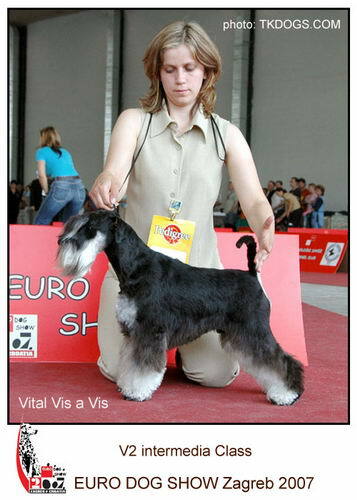 At Schnauzer-Pincher Club Show of Serbia and Montenegro 2004, Express Man was Junior Club Winner and BOB, under judge from Germany, Ms Elke Arhends. 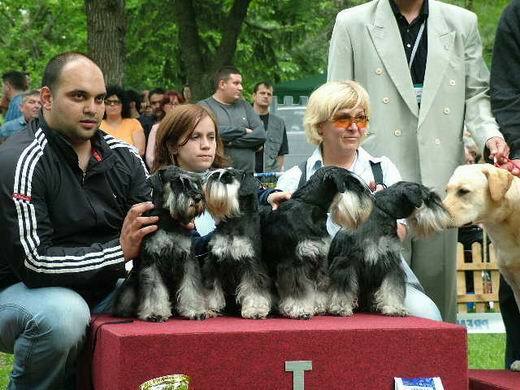 At Schnauzer-Pincher Club Show of Serbia and Montenegro 2005, judged by Mr Jan Liet from Holland, Express Man was Club Winner, and at Schnauzer-Pincher Club Show of Romania 2005, Express Man was Club Winner and BOB under Ms Eva Vadocs from Hungary. In 2006 on the Romanian and Serbian Club Shows Express Man again was successful . 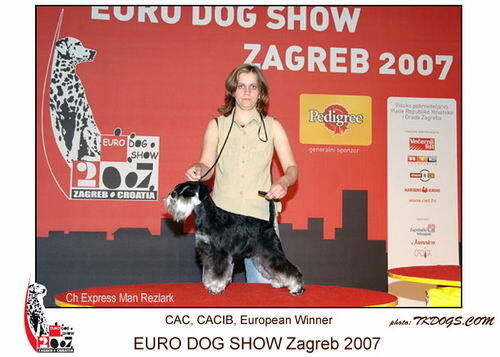 He become Romanian Club Winner and BOB 2006, judges were Calin Margineanu (RO) and Elke Ahrendts (D) and he become Serbian Club Winner and BOB 2006, judges were Gisa and Walter Schicker from Germany . In the same show Express Man Rezlark with his daugther House Kazak Sunflower become BEST BREEDING PAIR and with other dogs BEST GROUP and group of his progeny become - BEST PROGENY . 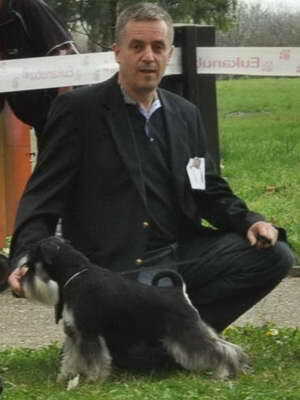 At Schnauzer-Pincher Club Show of Serbia 2007, Express Man was Club Winner, BOB and BIS, under judge from Italy, Mr Giovanni Pentenero. In the same show Express Man Rezlark for the second time with House Kazak Sunflower become BEST BREEDING PAIR and with group of his progeny become - BEST PROGENY. At ISPU show in Moscow, Russia , Express Man Rezlark in champion class was V1, CH RUS, ISPU Class Winner, CR ISPU, under judge E. Wieldraijer from Holland, at ISPU show there was entered 62 miniature schnauzers black & silver , champion class 9 males . 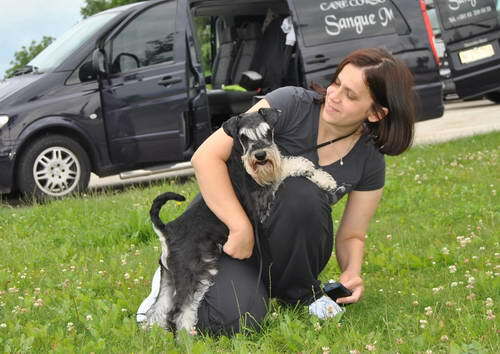 At Schnauzer-Pincher Club Show of Russia 2008, Express Man was V1, Class Winner, CR ISPU, BOB, Club Winner, RPSK Club Champion , under judge Javier Sanchez Fernandes (E) from Spain . With fourth CR ISPU ( Dortmund, Kragujevac, 2x Moscow ) - Express Man - ISPU Champion ! Oskar's best result is : EURO DOG SHOW 2007 Zagreb Croatia - 10.06.2007. judge Andrzej Kazmierski (PL) Express Man Rezlark - EUROPEAN WINNER 2007, CACIB, CAC . Vital Vis a Vis ( ''Toto'' ) is a male imported from Poland. He is born on November 07, 2005. Many thanks to Katja Pustovrh and her family for all the help we needed during the trip of this precious boy to us. In his pedigree there are dogs who, we hope, will bring a new quality to our dogs. Our choice fell on him because he ''gets along'' with Oskars descendants. His father is A Lover's Rampage Vis a Vis , and mother Intro Stazel . Little Boy Vis a Vis ( ''Sato'' ) is a male imported from Poland, from kennel Vis a Vis. He is born on January 20, 2009. His father is Repitition's Life of Crime and mother is Ayala Vis a Vis . Sato is dear little boy, very fast conquered my hear with his great temperament. I would like to thank all people who helped us, and are willing to cooperate in fulfilling our beautiful dream. Thanks to everyone who visited our pages and had a time to read ''About us''.